When did glamping in England get so cool? There was a time where no-one really knew much about glamping pods, huts and yurts (or maybe you still don’t hehe). Glamping can appeal to maybe people. The campers who want some extra luxury (and warmth during the winter months). Hands up, this is me! The families who want to take the kids away but without the hassle of buying or putting tents up. Or maybe those who want to feel closer to the outdoors, but without giving up all their sense of luxury! I’ve stayed in a few different glamping pods around, mainly in the National Parks which I’m regularly visiting. I’ve even a yurt in the Peak District which I absolutely loved. I wanted to see what more great glamping places there are around the country. I’ve asked some of my adventurous bloggers to share their favourite glamping spots in England. These glamping pods, yurts and huts are perfect for a last-minute winter break. Or maybe start planning your glamping breaks for the rest of the year. These cute glamping pods were a real treat when I stepped inside. I had no idea a simple pod could be transformed into a mini home for a few days. Inside the pods you had everything you needed with added luxury items including a shower and toilet! The decking outside overlooks the beautiful Lake District fells in the Kentmere Valley, on a good day and you can sit with a glass of wine (or cup of tea) to simply relax and take it all in. I stayed for a 2-day break in February and wish I could have stayed longer, since the weather turned into glorious sunshine the moment I left. But that didn’t stop me from having a wonderful time in the glamping pod and walks in the surrounding area. Of course, my favourite luxury item was the comfy bed tucked in the corner of the pod, with the light creeping under the blind waking me up in the morning, hearing the birds tweeting I felt 100% relaxed and part to of me didn’t want to get up. The glamping pod is designed to fit four people, with the sofa converting into a bed so everyone gets a comfy night’s sleep. I can imagine with four adults it might be a squeeze but on a warm evening there’s all the space outside the pod to enjoy. There are also some fantastic walks nearby to the pod, a few miles down the road you’re in Kentmere where you can hike the wonderful Kentmere Horseshoe walk. Alternatively, there are plenty of beautiful low-level walks you can do as well. If you’re looking for a peaceful spot in the Lake District with gorgeous views on your doorstep then this is the place for you. Views from inside the glamping pod! You can save a further £3 per night if you become a YHA Member (Only £15 to join)! Click here for annual membership information. The glamping pods at YHA Borrowdale were a great place for my winter break in the Lake District. As someone who loves the outdoors but every now and then wants to be a bit lazy and not have to pitch a tent the pods were perfect. The pods include all the luxury of being close to nature, with a sturdy wooden structure to protect you from the rain and wind. Plus two comfy beds inside, complete with bedding and a heater and light too. If that’s not luxury then I don’t know what is! One of the best things about glamping at YHA Borrowdale is that you have the best of both worlds. You are close to the outdoors, where you can cook outdoors. Or in the colder months, you can make use of the indoor kitchen, dining room and cosy bar, complete with a fire to keep you toasty and warm. Plus, if you want an itinerary for some walks to do whilst you are there, here are the routes I did over my 4-day trip in the Lake District. All starting at YHA Borrowdale. 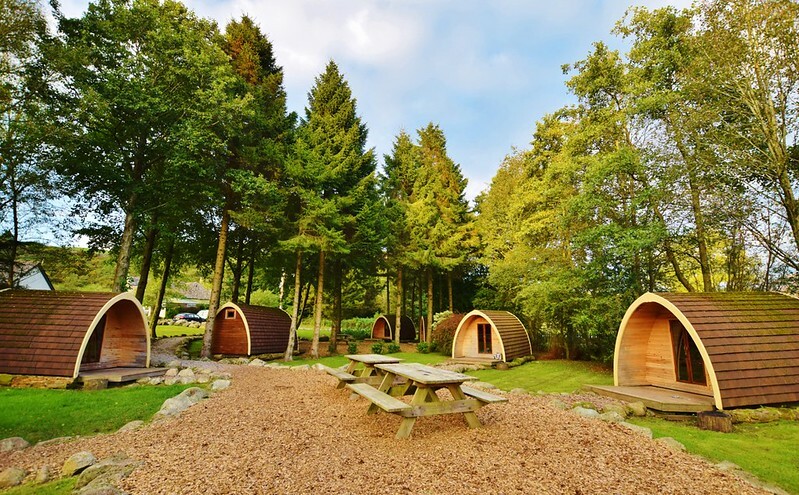 Eskdale glamping pods are located on their campsite in the beautiful Lake District National Park. These glamping pods were the first one in England so they are a little rustic. By that, yes they are old but they have a certain charm about them, moss-covered roofs and logs surrounding them. It does mean that these glamping pods are as modern as others you might read about, there’s no heating or lighting so don’t forget your torch as it gets dark inside. One of my favourite things about the glamping pods was the mini-community of pods, there are 10 in total, split into two small groups. There are picnic tables in the middle area creating a real sense of socialising, fun and activity when the pods are full during the summer months. Want to read more about my stay at Eskdale Campsite, including a full review of the glamping pods? Click here for details. The Peak District is one of my favourite places in the UK. This campsite is located close to the town of Hathersage. But still a drive away from civilisation, which is what I love about it. It’s a small campsite, near Stanage Edge, a popular place with both walkers and climbers. The pods are scattered amongst the trees and make them hidden from view. Inside the pods are fairly basic, with a heater, light and roller blind, so you’ll need to take all your own bedding and cooking equipment. Each pod has its own name (so you don’t get mixed up) and porch area, perfect for cooking and enjoying the views. Fancy glamping in a geodesic dome? At ‘In the Stix’, there are four white geodesic domes nestled in the valley in the heart of Rutland. Each dome has a field kitchen, pizza oven and your own private hot tub! The domes are very spacious – a lounge area with a log burner for those chilly nights, a curtained-off area with a king-sized bed and a mezzanine level with two further double beds. There’s even a bathroom with hot running water and solar panels provide all the electricity. There is also a private field kitchen, bathroom in the dome and shop selling basic items. We loved relaxing in our private hot tub at night with a glass of fizz in hand, looking up at the stars. Doesn’t that sound perfect? The only things we didn’t like was the electricity storage unit failing twice, even after being replaced and having to strip our beds on departure day; considering how much money it costs to stay there. This place is great if you’re looking for some R&R – Glamping with all your home comforts. I only recently stayed at this glamping site in the Peak District. It was a winter trip and I decided that I needed a bit of luxury! The yurt is meant for 5 people but taking luxury to a new level, I booked with one other friend so we had plenty of space haha. 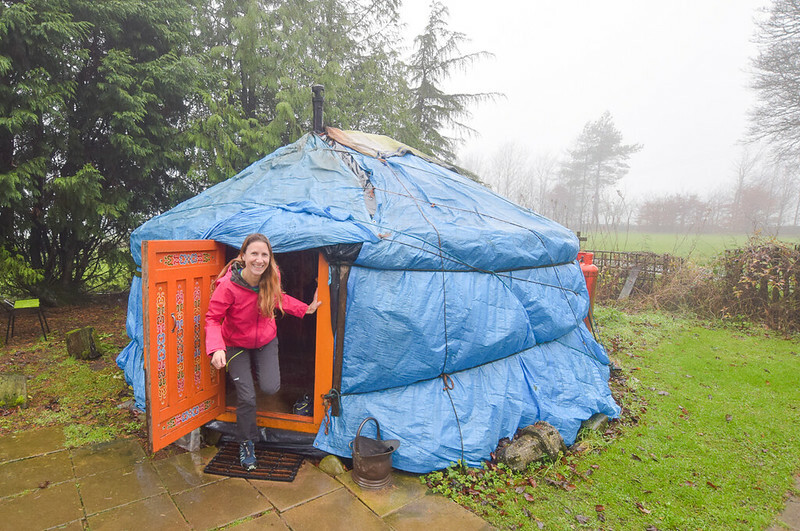 The yurt includes everything you could need for a weekend or week away in the beautiful Lake District. Well, except bedding and food! But mattresses are provided so it’s only sleeping bags and pillows. There are plenty of local walks you can do directly from the yurt or you can simply jump in the car and drive to nearby beautiful spots. I will be organising a walk soon at the location nearby so feel free to get in touch if you want to join! If you’re looking for a truly luxurious glamping experience, book a stay at Wriggly Tin Shepherds Huts ASAP! The huts are comfortably furnished and have everything you need for a weekend away, including a wood-burning stove. In fact, you won’t even need to leave your hut if you don’t want to, except to fetch water and visit the bathroom hut. Each one has a unique theme and is so beautifully done that you’ll want to stay in all of them! The glamping site is located in Hambledon, in Hampshire. Just across the street and over a hill is the award-winning Hambledon Vineyard, and a pleasant countryside walk away is the Bat & Ball pub, famous for its cricket memorabilia. 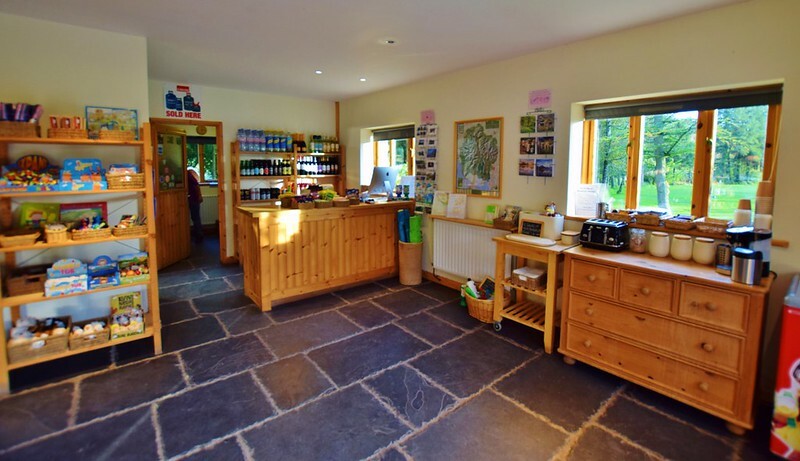 There is plenty to do in the area, but we love nothing more than hanging out at Wriggly Tin – reading, playing board games, and, at night, stargazing in the incredible Dark Sky area. Insider tip: Book a stay in the Winchester hut and ask to add on the wood-burning hot tub. It’s only available in that hut, so book early! Field 725 is a new glamping site located in Frome, Somerset. The site offers a range of glamping options, including “kula” tents, a shepherds hut, and even a glam-PLANE. The tents are quite close together, but angled apart from each other, giving each tent a bit of privacy to enjoy the sights and sounds of the countryside. The glamping site has all of the facilities you need for a glamping trip – toilets and showers, a working kitchen, and tea & coffee for you to enjoy. The only downside of the site is that the tents do not have a fireplace inside them, making them a rather chilly place to stay in the shoulder season. The best part about Field 725? It’s perfectly located close to Frome, a lovely town with everything you need for a perfect weekend away – charming, independent shops; local pubs; and, a delicious café serving up one of the best brunches ever! We love the many variations of glamping and one stay that we particularly enjoyed was in a traditional Mongolian yurt in December. The yurts at Caalm Camp near Shaftesbury in Dorset are set in the middle of the countryside and come with a large communal kitchen, private wet rooms and living room space in a separate block. 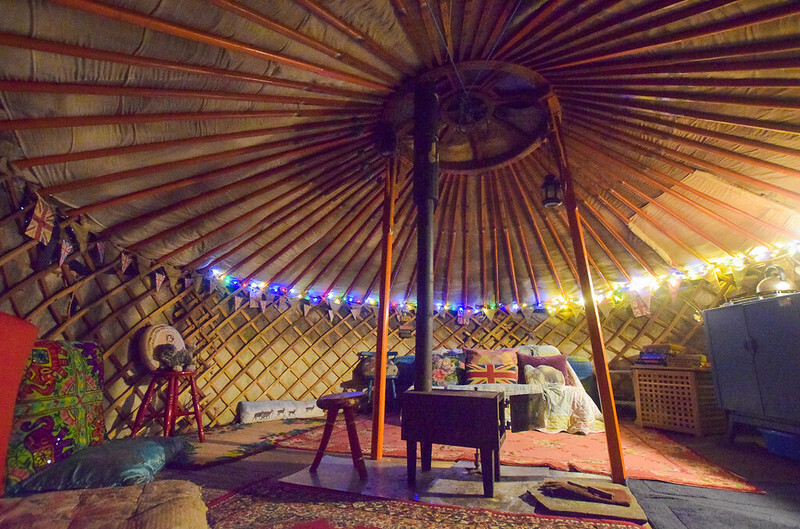 The yurts, which each sleep up to six people, are beautifully decorated and come with a wood burner, small camping stove, bedding and a fire pit outside. The site also has a separate kitchen, private bathroom, living and dining area, playground, bookable pizza oven. We loved stargazing at night and the convenience of a fully equipped kitchen a short walk away. We’d recommend Caalm Camp for anyone looking for their first glamping experience and would definitely book to stay again ourselves. Sign up now for my monthly newsletters, all my latest posts, top travel and hiking tips. Plus competitions, giveaways and discounts so you can travel more! FREE Beginner’s Camping + Road Trip Checklists when you sign up + 20% Discount code off Water-to-Go Bottles and More! We loved our stay at Caalm Camp in Dorset – such a great site. There’s some great recommendations here that we’ll have to seek out too.